Corfu is a fairly big island and has various landscapes. Much of the island is beautiful with its trademark cypress trees, hills and lovely coastline. On the other hand, it has developed a lot over the last years with luxurious resorts by the beach and occasionally this spoils the beautiful natural landscape. Corfu is a large, mountainous island. The capital is located on the eastern coast and here you will find a hive of activity with most of the tourist resorts located above and below it. Away from here it is possible to find some remote, unspoilt areas. Indeed, much of the island is undeveloped and you will pass by small, calm villages with old inhabitants working the land or relaxing in the traditional kafenions. Depending on where you go on the island, you can come away with the impression of tacky tourist resorts or a place of unspoilt beauty. It is best to see as much of the island as possible because the places that are often away from the hive of tourist activity are often the nicest. The island has a selection of superb beaches but in the inland there is much to discover. In Corfu Town, the architecture is splendid and has many Venetian styles. Do not miss the two fortresses in Corfu Town and the Achilleion Palace in Gastouri village. Due to the large size of the island, a week holiday at least is necessary to explore it. The port is located 2 km from Corfu Town and there are many taxis every time a ferry arrives. 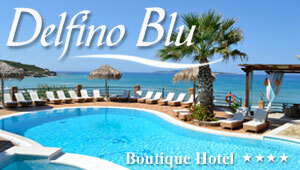 Have in mind that Corfu is a big island and your accommodation may be situated far away. Although the bus station to beaches around the island is close to the port, bus schedules may not be that convenient. To go from the port to the center of Corfu, take the blue bus No 2 from the bus stop opposite the central gate of the port. The airport of Corfu is located 2 km from Corfu Town. There isn't a bus serving the airport but there are many taxis outside the airport gate. The majority of Corfu has good and asphalted road network. However, most roads are narrow (one line per direction) and winding at some points.